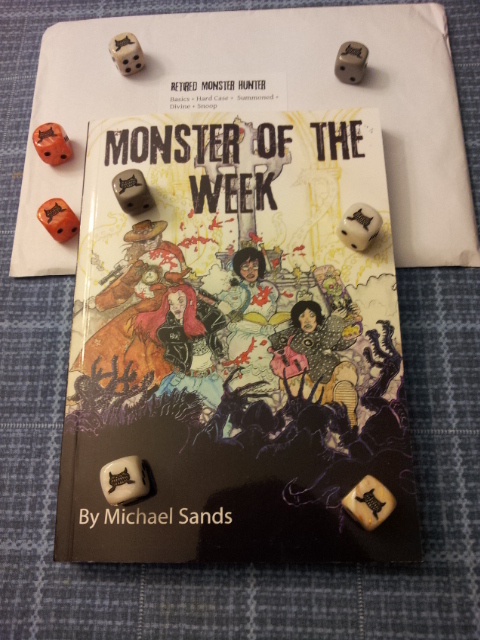 Awhile ago, I sponsored the IndieGoGo campaign for Monster of the Week by Michael Sands. Monster of the Week is a part of the burgeoning Apocalypse World hack ecosystem. I was pulled into the IndieGoGo campaign with the one-two punch of Apocalypse World engine and “It models seasons of Buffy the Vampire Slayer. I’ve read a good portion of the PDF, but didn’t finish it. I find game books are easiest for me to read in physical form – in fact most books remain easier for me to read if I have a physical copy. To my knowledge, this game is the first RPG I’ve purchased from a New Zealander. I’m looking forward to reading this book and giving it a try. I’m going to run at least one session before GenCon so I should have this in my repertoire of games that I can run at Games on Demand. More importantly, when I mentioned that the game was partly inspired by Buffy the Vampire Slayer, my kids immediately perked up – they love Buffy, Xander, Willow, Giles, Spike, and company. The challenge remains not enough time for all the games. At least we got a few hands of Tichu in this evening. What Should the Game Master Fight For? Just Arrived - Monster of the Week by Michael Sands by Jeremy Friesen is licensed under a Creative Commons Attribution-NonCommercial-NoDerivatives 4.0 International License. Based on a work at https://takeonrules.com/2012/07/20/just-arrived-monster-of-the-week-by-michael-sands/. Permissions beyond the scope of this license may be available at https://takeonrules.com/more_permissions/.